Germans are voting in a keenly-watched national election which could shape the direction of Europe's largest economy. Chancellor Angela Merkel's conservatives are favourite to win and deliver her a second term in office. But she hopes to win by a big enough margin to be able to ditch her Social Democrat coalition partners and work with the more reform-minded FDP. A BBC correspondent says there is no great appetite for such a coalition and that people prefer the status quo. Security is tight after al-Qaeda warned Germany over its Afghan war role. Mrs Merkel's main rival in Sunday's vote is the leader of the Social Democratic Party (SPD) and current foreign minister, Frank-Walter Steinmeier. The SPD have shared power with Mrs Merkel's Christian Democrat alliance (CDU/CSU) in an awkward grand coalition since the last elections in 2005. The first exit polls will appear when polls close at 1800 local time (1600 GMT), but the full outcome may not become clear for several hours. Election officials said turnout by 1400 was considerably down on the last elections - 36.1% compared with 41.9% at the same stage in 2005. The BBC's Jonny Dymond in Berlin says there has been a steady stream of voters at one polling station, as people enjoyed clear skies and brilliant sunshine. Voters were divided about the possible outcome. "I hope we get a different coalition. To be honest, I am currently unhappy with the way things are and hope that we end up with a black-yellow [CDU/CSU and FDP] government," one woman told the BBC. "A red-red coalition [SPD and Left Party] would be an absolute catastrophe, in my opinion." Katrin Rivier, a 49-year-old Berlin nurse, had other priorities. "It was difficult to decide who to vote for, but I know who I don't want in government, so that helped me," Reuters news agency quoted her as saying. "I think it will be a very tight race today but I'm hoping we don't get a centre-right coalition." Another voter told the BBC the status quo would remain. "The possibility of a change of government is not that big, and I am assuming that we will end up with the same government that we had before the election," he said. In an interview for the Sunday newspaper Bild am Sonntag, Mrs Merkel said she was "optimistic" of forming an alliance with the FDP. 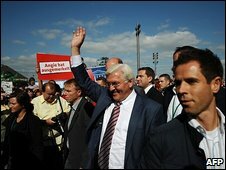 As he cast his vote, Mr Steinmeier was also upbeat. "I am very confident we will have a strong SPD. A strong SPD that will be able to lead the government from the top this time," he told reporters. Opinion polls suggest Mrs Merkel's lead has narrowed in recent weeks, though our correspondent says there is little doubt that she will be returned as leader of the largest party and as chancellor. But it is unclear whether she will be able to team up with the small FDP to create a coalition that could push through economic reforms. Few people have a bad word to say about her, our correspondent adds, and she has won plaudits for her steady leadership during the economic downturn. But he says most people he has spoken to seem happy with the current grand coalition, and if the polls are to be believed there will be a nail-biting finish to the day. One in four voters were still said to be undecided on the eve of the vote. The campaign has been overshadowed by security concerns following a series of al-Qaeda messages warning Germany to pull some 4,200 troops out of Afghanistan. All flights have been banned over the traditional Oktoberfest in Munich, and armed police are guarding airports, train stations and city centres across the country.